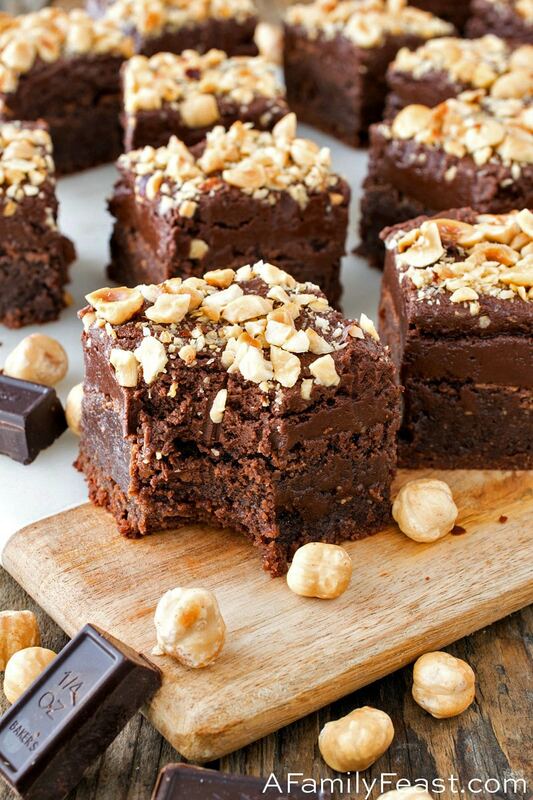 These incredible Hazelnut Brownies are rich and fudgy brownies that are loaded with nuts, then topped with a sweet Nutella-hazelnut frosting. 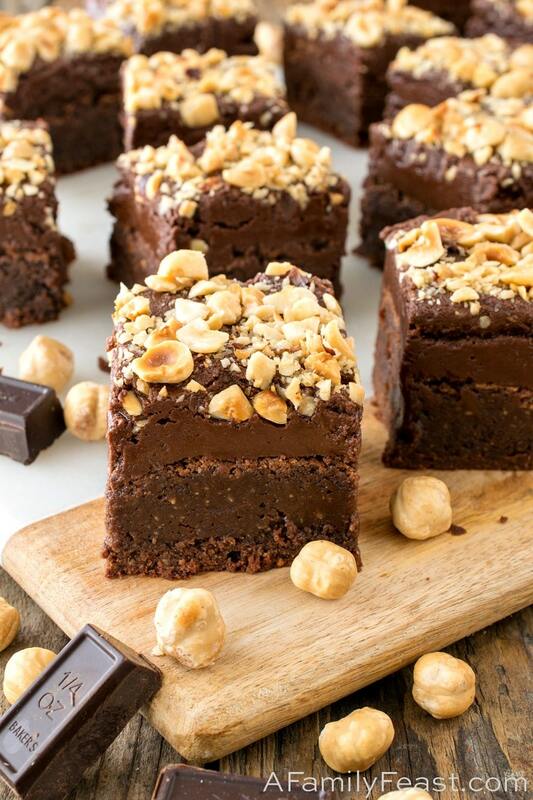 When the craving for something sweet and chocolatey and nutty strikes hard – these delicious Hazelnut Brownies are the answer! 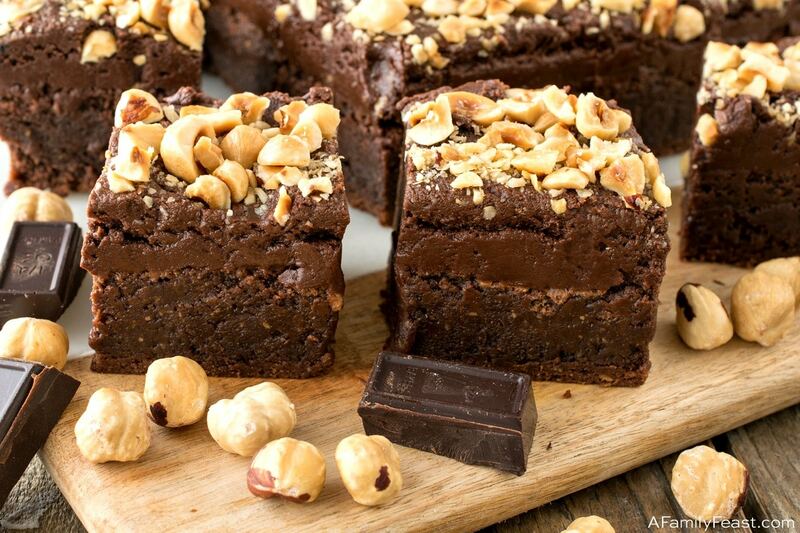 I absolutely love salty-sweet food combinations — even more so when it’s chocolate and nuts together. 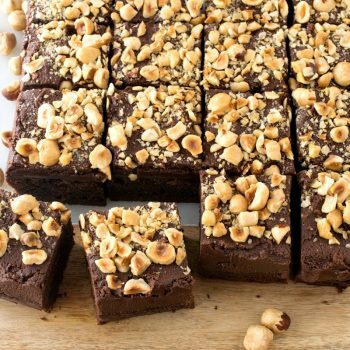 So, you can imagine how happy I was when my husband Jack (on a whim) decided to bake these easy Hazelnut Brownies. 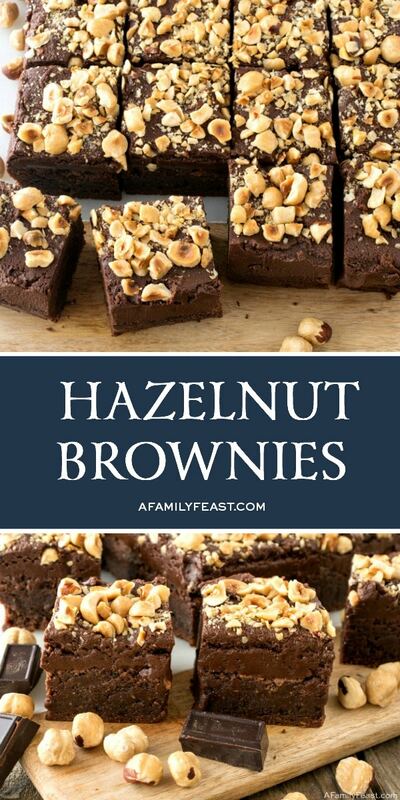 How do you make Hazelnut Brownies? 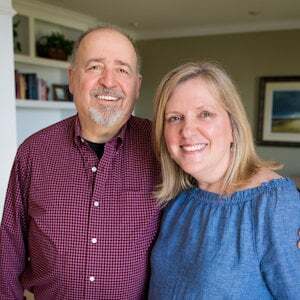 Jack started with our favorite, go-to brownie recipe off the back of a box of Baker’s unsweetened chocolate, but he added in chopped, roasted hazelnuts, as well as cinnamon and espresso powder to the classic brownie batter. 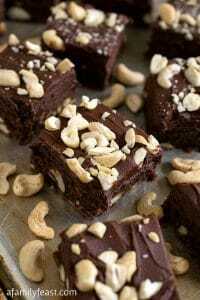 Once the Hazelnut Brownies baked and cooled, he topped them with a generous layer of chocolate buttercream frosting that was also flavored with espresso powder and Nutella. 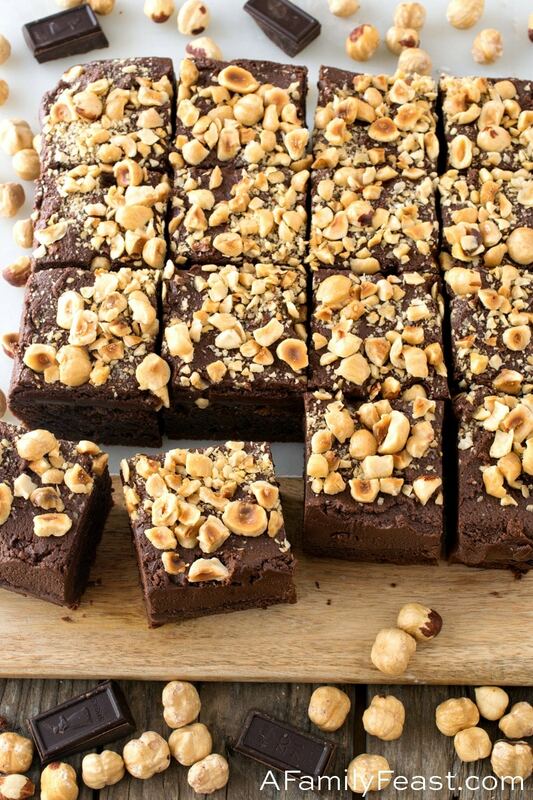 Finally, Jack sprinkled chopped hazelnuts over the frosting — and our incredible Hazelnut Brownies were ready to devour! 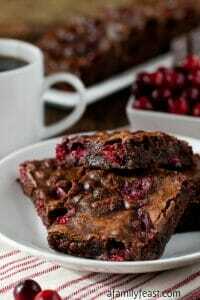 These Hazelnut Brownies are especially good served with a cold glass of milk or a hot cup of coffee. 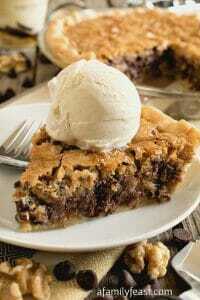 Either way, you’ll love this decadent sweet treat! Prepare a 9×9-inch pan by lining with two sheets of folded aluminum foil so that foil handles stick up on all four sides. Spray the inside with kitchen pan spray. Place 1¼ cups roasted peeled hazelnuts in food processor and pulse a few times to break them up. Add granulated sugar and process for about ten seconds or until the consistency of beach sand. Add eggs and vanilla and pulse a few times to mix. Add ground cinnamon, espresso powder and flour and pulse to combine. In a large microwave safe bowl, place butter and Baker’s chocolate and microwave in three 30-second bursts, stirring each time. 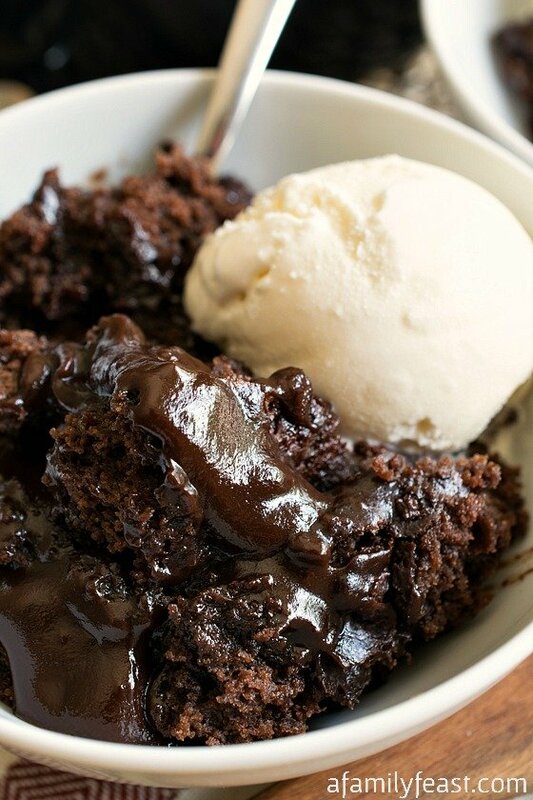 Remove from microwave and keep stirring until all of the chocolate is dissolved. Add the mixture from the food processor and stir until completely mixed. 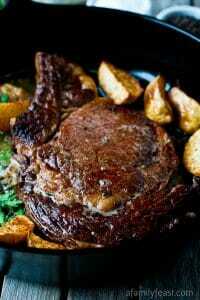 Poor into the prepared pan and bake 35 minutes or until a toothpick inserted into the center comes out clean. Check at the 30-minute mark. Let cool for 5 minutes in the pan then lift the foil handles and transfer to a cooling rack and cool completely. When ready to frost, place semisweet chocolate chips and heavy cream in a medium microwave safe bowl and microwave for 30 seconds and stir. Add butter and espresso powder and microwave for 30 more seconds. 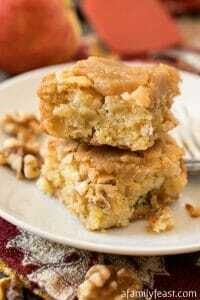 Stir mixture until smooth and then add the Nutella and confectioners’ sugar and stir to a creamy thick consistency. Spread over the top of the cooled brownies. 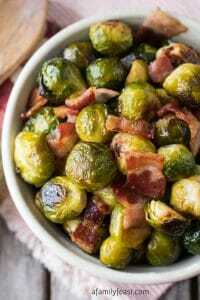 Take remaining ½ cup of hazelnuts and place between a folded sheet of parchment paper and smash a few times with the bottom of a heavy pan to crush, leaving some larger pieces. 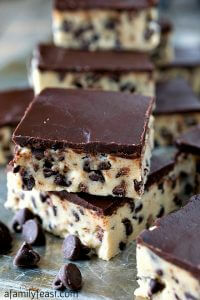 Sprinkle this over the frosted brownies and cut into 9 (3×3) or 12 (3×4) portions and serve. Leaving the skins on the hazelnuts will add a bitter flavor to your Hazelnut Brownies. Do yourself a favor and buy hazelnuts that are already roasted and peeled. We found Italian imported Trucco brand roasted and peeled hazelnuts at our local supermarket in the same section with dried fruits and nuts. Basically, just open the package and use. However, if you did not buy already peeled and roasted hazelnuts, heat oven to 350 degrees F. Lay out raw hazelnuts on a sheet tray and roast for 10-15 minutes, shaking every five minutes. Then pour into a dish cloth and rub around and over the nuts to remove the skins. There is a another method to remove the skin from hazelnuts where you place the nuts in boiling water with baking soda for 3-4 minutes, drain, pinch off skins, then roast for 20 minutes. Either way, some work is involved so if at all possible, buy them already prepared.